Not all love bacon in the form in which it is sold in stores. It is understandable, you can often buy or undercooked product, or fat without a single layer of meat. That is why cooking at home. Start with tested recipes make, for example, lard with spices for a couple. • Bay leaf – 2 PCs. 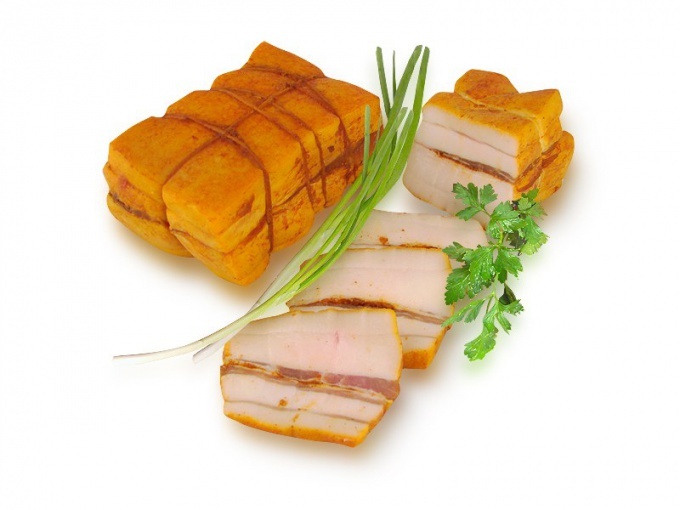 Slightly frozen bacon cut into narrow strips up to a width of four inches. The product did not cling to the knife, pre-sharpen, and a well cool tool. Chopped pieces thoroughly and RUB proselyte much pepper or mixture of peppers ready. Salt is recommended to take large, but the pepper should be a small fraction. Cloves of garlic crush with a knife or the special tool and RUB them sides of each slice of bacon. Take in fat the slits to 0.5 cm and put in them a couple of broken Bay leaves. The resulting billet is put in the refrigerator and leave overnight. During this time the fat will have time to absorb all the spices and the aroma of the Bay leaf. Be sure to cover the bacon, or together with the aroma of spices will absorb it and the smell of the refrigerator. Cook the bacon in a double boiler or a slow cooker. If you do not have a regular steamer, it's not scary. Put the slices in a colander, which, in turn, place in a pot with water (so the blender) so that the colander does not touch the surface of the water. Put the saucepan on the fire, bring to boil and leave on for at least 40 minutes. This time will be enough for gentle and soft fat. However, if you took the solid pieces, then boil better hour, and sometimes two. Willingness fatand check with a fork: the bacon ready in case if the fat is easily punctured. remove the dish and let it "rest" on the rough canvas (for example, drain bacon on towel). Decorate with greens, add some sliced garlic and serve with black bread. For this recipe you can cook any bacon, as the most rigid, and, on the contrary, very soft, with a thin layer of meat. Method of cooking fat for a few convenient for several reasons: it absorbs water and salt from it is not washed out, and the final product will not be salted and, finally, what is perhaps the most important thing on a finished dish, all the spices, they are not washed with water. This fat you can take with you anywhere, from a trip into the woods to work. 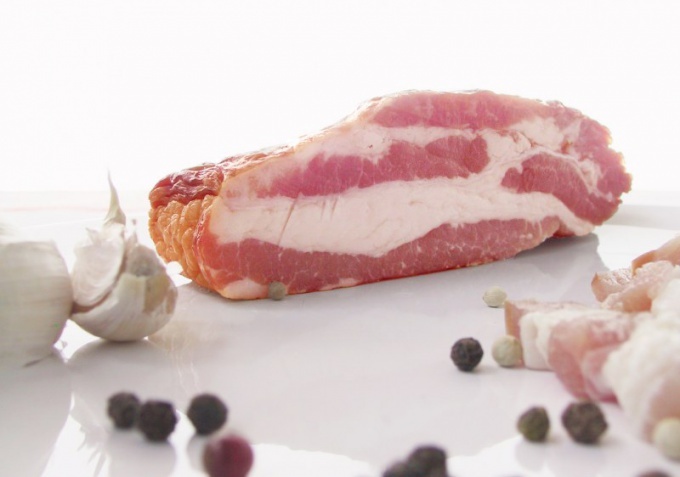 Subcutaneous pork fat — bacon — contains about 1.4% protein and more than 92% fat. Bacon is salted with herbs and spices, and then the desire a bit extra bloat. Eat fat, cut into thin slices, fry until greaves or added to meat and vegetable dishes. Slice the bacon in small pieces and put in a saucepan. Prepare the brine. Dilute with cold boiled water, salt. Add red and black peppers. Put the mixture on the fire, bring to boil and boil for 8 — 10 minutes. Pour the fat brine. Leave the bacon in brine for half a day (about 12 hours). Then carefully dry on a paper towel. Sprinkle the bacon with a mixture of peppers — red hot and sweet. Take a narrow piece of salt fat. Carefully grate the fat ground black pepper. Garlic skip through chesnokodavilku. Wipe them with a piece. Make a few slits in the fat. Paste the Bay leaves. Put the bacon into a bowl and leave on for 10 to 12 hours in the refrigerator. During this time, the fat is impregnated with the aromas of the spices. Dip pickled pork fat in a colander and place in a pot of water. Put the dishes on the fire, bring water to a boil. Turn down fire and cook the bacon for a couple from half an hour to two hours depending on the quality of pork fat. Soft tender bacon you can cook for 40 minutes, the hard piece should be about a couple of hours. Pierce the fat with a fork. Ready fat pierced very easily. The fat will cool and leave in fridge for a few hours. When the fat has hardened, cut it into thin slices. Slice the bacon pieces with a length of about 30 cm and a width of about 15 cm, Mix in a bowl salt, sugar, red pepper, Basil, pureed garlic through chesnokodavilku. Pour half of the mixture in non-oxidizing capacity, put the slices of bacon on top and pour second half of mixture. Lay the Bay leaves, thyme sprigs and pepper. Cover the bowl with cling film and foil to protect from light penetration. Lay on top the weight of about 5 kg. Dishes with bacon place in a cold place for 10 to 14 days. Several times during this time, turn the bacon and mix spices. At the end of pickling, the piece will become dense. Rinse the bacon under cool running water from the salt. Wrap in cheesecloth and dry. Make a well in one corner of the piece a small hole, thread the rope. Hang the bacon in a cool dark place at 20 to 25 days. It is desirable to maintain the room temperature around 15 ° C and humidity 60 — 70%.